When we first began to kayak in Belize we naturally looked around for interesting rivers in addition to sea kayaking from island to island. 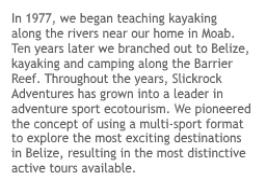 My partner Cully had gotten his start in the adventure travel business by teaching whitewater kayaking on the Colorado River right near Moab where we still live. Right away we started hearing about this amazing jungle river you had to run by flashlight. The Caves Branch reportedly went underground for many miles before resurfacing. We couldn’t find anyone who knew for sure if you could run it, but everyone said the same thing: we had to talk to Ian Anderson. So we drove on out to this obscure spot off of a very bad road called the Hummingbird “Highway”, and there was Ian, living in a shack in the jungle. He was starting up a remote jungle lodge (he called it a “jungle camp” back then) offering caving tours using Belizean guides that he was training himself. He had already been down the Caves Branch River, but not in kayaks, because he didn’t own any. We ran it shortly after meeting him, and it was one of the most amazing things we had ever seen. Later Cully started our Belize Adventure Week trip, the first jungle/island sport combo package offered in the country. That itinerary has changed over the years as we have learned more about the country, but we have never stopped running the Caves Branch, launching from Ian’s property. 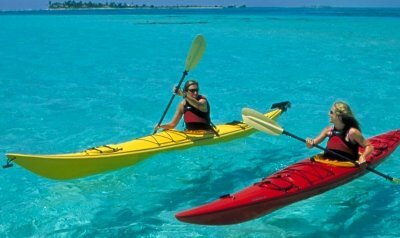 This is without a doubt the best one day activity in Belize. Back then we stayed at Ian’s during the inland part of our tour, so we spent a lot of time with him. He took me on many of his cave tours himself. He pioneered Belize caving, and he remains the leader in this field. He took me to Footprint Cave and the Black Hole Drop where you rappel 300 feet down through the jungle canopy. I remember exploring other caves that were not even named yet. It’s been years since I have seen Ian because we are both so busy. Even though I ran the Caves Branch last April, we just drove the dirt road through the orange grove to the Blue Hole Branch put-in, I didn’t have time to go find him. But a few days ago we stopped at Ian Anderson’s Caves Branch Jungle Lodge on the travel agent tour and there he was! I can’t begin to explain how great it was to see him. We have both come so far, and worked so hard for so long, that for me it brought the whole journey back just seeing him again. Cully and I have gone from young kids with a few kayaks and an old van to owning the island. And Ian has come even further. His place is stupendous. He has a huge greeting center for day tourists, a giant open-air bar and dining area, a huge pool with two waterfalls, 5-star treehouse accommodations, a botanical garden with an impressive orchid collection and all plants labeled and described, a search and rescue training program for remote Belize, and a chess camp for Belizean kids that they fund in part by selling soap they make right on the property using rainforest ingredients collected nearby. Even though his jungle accommodations are AMAZING, his chess camp was the most impressive thing about the whole visit. There was a table of kids with an El Salvadoran chess coach studying for the Central America Chess Championship. What an amazing chance for these kids! Public school in Belize only goes through the 6th grade; Ian will change many lives with this program. As he said himself, chess is only the vehicle… it’s about building self-esteem and creating new opportunities for disadvantaged kids. Already 1100 kids have been through his Belize chess program. The kids we saw at that table were the best in the country, and they are staying right at the jungle lodge for a week at no charge, working with the coach Ian and his wife Ella have brought into Belize just to work with them. Ian gave all the credit to Ella for coming up with the idea for the chess program. I hated to leave, I could have stayed for days. But after a fantastic tour and delicious rum punch, we hit the Hummingbird Highway (now paved) and drove on south to Placencia.